Do you love to see the signs of spring? Do you enjoy getting outside in the great outdoors in spring? Are you a romantic at heart? Would you like to surprise that special someone in your life with a special outing? If you answered yes to any of those questions, it’s time to “spring” into action and plan a little spring picnic! Follow these simple suggestions to plan the perfect, fun, romantic outing with your favorite person and you’ll be considered a romantic genius! The first thing to do is to choose the location. When picking out the perfect picnic spot, consider what your special someone likes. The goal is to choose a spot that you both will love! While it’s always fun to “people-watch,” you might want to choose an area that’s more quiet and serene rather than an area that’s overly crowded. Do a little research and choose a spot that is safe, pretty and not too noisy so you can focus on each other. The wonderful thing about planning a picnic in the Smoky Mountains is that there are countless quaint mountain spots that would be perfect for a little picnic outing! Next, select a picnic basket. Choose a basket that is large enough to hold the necessary items, but make sure it’s not too heavy to carry once you have it loaded up! After you have your picnic basket, start collecting all the essential items that you’ll need, such as a blanket, towel and napkins, plates, cups or glasses, and utensils. Blankets need to be large enough to comfortably stretch out on and allow you to spread out all the food items you bring. Choose a waterproof blanket so that you won’t get damp even if the ground or surface is damp. If you want to keep your blanket stretched out tightly on the ground & prevent ripples or wrinkles in your blanket, you can bring 4 tent stakes and a hammer to secure the blanket edges down. If you can, it’s always a nice touch to bring some cushions or pillows to make your outdoor setting even more comfortable. If you love wine, then this is the first thing you need to have your basket. Pick a bottle of your favorite wine. Make sure to also bring a cooler, ice, and a couple of wine glasses. If you aren’t a wine drinker, then just pop in a bottle of your favorite soda, flavored water or favorite drink. Also, a very important point, remember to pack a wine bottle opener! It would be a shame to have a great bottle of wine and no way to open it! Nothing says romance quite like a bottle of wine, your favorite chocolate, and relaxation in a beautiful mountain setting! Make sure to find out what your partner’s favorite chocolate is and tuck some of it away in your cooler. Don’t forget to put it inside a plastic bag so it won’t get wet & soggy. Flowers can be a wonderful surprise for your partner! Remember that you don’t have to spend alot of money on flowers… you can usually pick up a beautiful inexpensive bouquet at your local market or grocery store. Hide a bunch of flowers in the car and present it to your partner at just the right moment! For a quick energy snack, take a bag of dry fruits & nuts or some trail mix. You don’t have to worry about refrigerating these and they always make a great snack! Granola is another great choice that travels well and is a great snack! The menu for your picnic can be as simple or extravagant as you like, it’s all up to you! You can choose simple sandwiches, traditional fried chicken, gourmet feasts or anything in-between. Check out your favorite restaurant and place a takeout order. Another good idea is to check in your area to see if special picnic lunches can be ordered. Pack a few of your favorite foods as well as some finger foods like grapes, strawberries, veggies, cheese and crackers, etc. When planning a romantic picnic, make sure you include the insect repellent. Just imagine what will happen if mosquitoes, flies or other uninvited guests decide to join your romantic outing. To avoid this, always include a bottle of insect repellent. Music is a great atmosphere-creator! Set the tone for romance by playing some of your favorite love songs from whatever venue you prefer. If you’re not sure what type of music your special someone prefers, then opt for smooth jazz. Smooth jazz is relaxing and has a universal appeal no matter what style of music you may prefer. Make sure you fully charge your phone, ipad, ipod or other music source so you can enjoy music throughout your entire outing. No matter what special drink you choose to take, make sure you pack some bottled water! Remember that you’re outside and you need to make sure you remain well hydrated. You can also take a thermos of coffee or hot chocolate if it is a chilly day! A staple for every outing, include a bottle of hand sanitizer! After setting up your picnic, you’ll want to cleanse your hands before opening the wine and food. It’s always a good idea to bring a roll of paper towels or extra napkins, just in case of spills, cleanup or other emergencies. Moist towelettes are always a welcome picnic staple, especially if you’re serving messy foods. You can also take extra water for clean up as well. No one ever expects to have an emergency situation, but when they happen, it’s invaluable to be prepared with a few supplies. Slip a small emergency kit in your basket just in case. Don’t forget to check the weather forecast before you set out on your excursion! The best-laid plans can be totally ruined if Mother Nature decides not to cooperate! Have a “Plan-B” ready to go with an alternate indoor location should your outdoor plans be ruined by bad weather. Now for the two most important ingredients of a great romantic picnic… Relax & Enjoy! 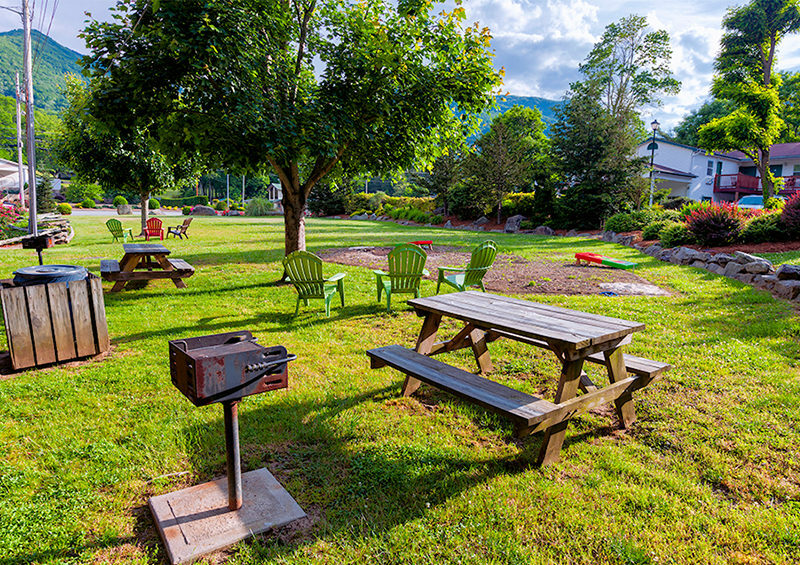 If you are planning this picnic during your visit to the Smoky Mountains, make sure you’re staying at Creekside Lodge. 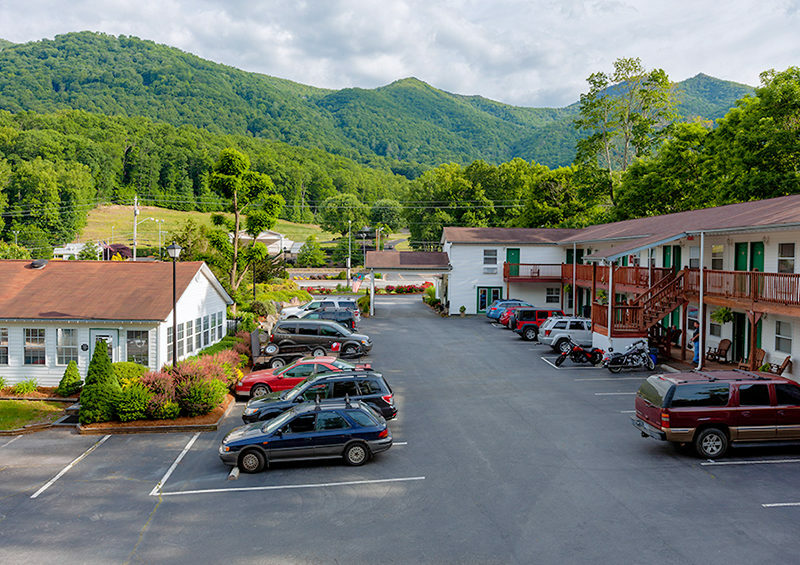 Creekside Lodge in Maggie Valley is a quaint, family owned and operated mountain getaway, conveniently located just 30-40 minutes outside of Asheville, NC. 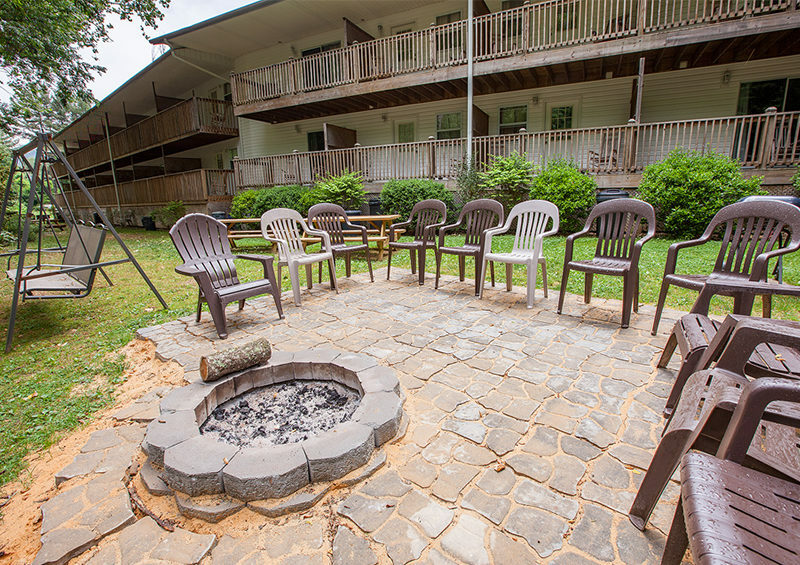 Our staff would be happy to help you plan your romantic picnic and other wonderful activities during your stay in the Smoky Mountains. 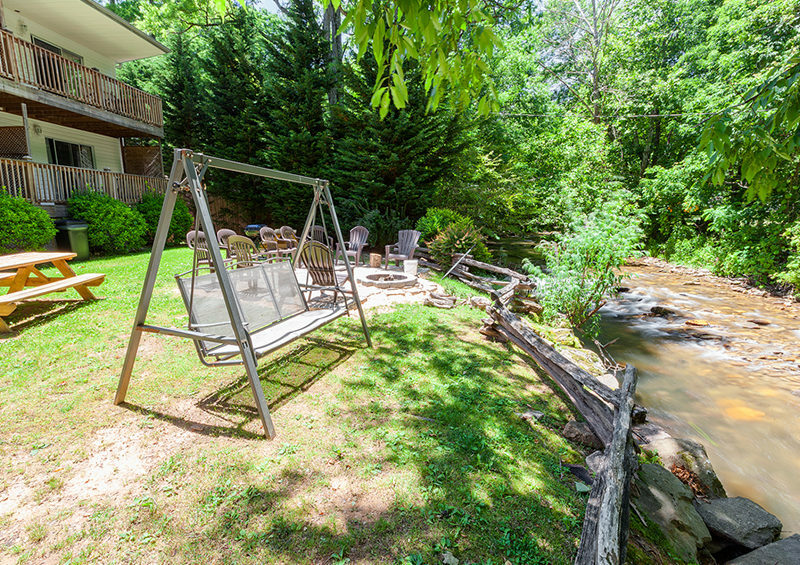 Call us today at 800-621-1260 and reserve your mountain getaway! Your romantic picnic in the Smoky Mountains will be a memory you’ll never forget!